My family loves bell peppers. They love them raw, grilled, roasted whatever. As a kid I never ate them, but my children got their first bites as toddlers and haven't stopped munching since. Now I am hooked as well. Provide colorful protection against free radicals - Brightly colored bell peppers, whether green, red, orange or yellow, are rich sources of some of the best nutrients available. To start, peppers are excellent sources of vitamin C and vitamin A (through its concentration of carotenoids such as beta-carotene), two very powerful antioxidants. These antioxidants work together to effectively neutralize free radicals, which can travel through the body causing huge amounts of damage to cells. Reduce Risk of Cardiovascular Disease - For atherosclerosis and diabetic heart disease, peppers also contain vitamin B6 and folic acid. Promote Optimal Health - Red peppers are one of the few foods that contain lycopene, a carotenoid whose consumption has been inversely correlated with prostate cancer and cancers of the cervix, bladder and pancreas. Recent studies suggest that individuals whose diets are low in lycopene-rich foods are at greater risk for developing these types of cancers. Promote Lung Health - If you or someone you love is a smoker, or if you are frequently exposed to secondhand smoke, then making vitamin A-rich foods, such as bell peppers, part of your healthy way of eating may save your life, suggests research conducted at Kansas State University. May Mean Better Eyesight - Bell peppers appear to have a protective effect against cataracts, possibly due to their vitamin C and beta-carotene content. Protection against Rheumatoid Arthritis - While one study suggests that high doses of supplemental vitamin C makes osteoarthritis, a type of degenerative arthritis that occurs with aging, worse in laboratory animals, another indicates that vitamin C-rich foods, such as bell and chili peppers, provide humans with protection against inflammatory polyarthritis, a form of rheumatoid arthritis involving two or more joints. Nutritional Facts: One cup of raw, chopped red peppers provides over 100% of the DV for vitamin C and vitamin A. Red peppers are also an excellent source of vitamin B6. Green peppers are a very good source of fiber, folate, and vitamin K as well as the minerals molybdenum and manganese. In addition to beta-carotene, red peppers contain the beneficial phytonutrients lycopene, lutein and zeaxanthin. Tips for Preparing Bell Peppers: Before coring and/or cutting the pepper, wash it under running water. If the pepper has been waxed, you should also scrub it well. Bell peppers are on the list of veggies containing the highest amounts of pesticides if conventionally grown. So either wash thoroughly using one of our natural veggie wash recipes or buy organic. Yes, green peppers are technically unripened bell peppers, therefore a little harder to digest. 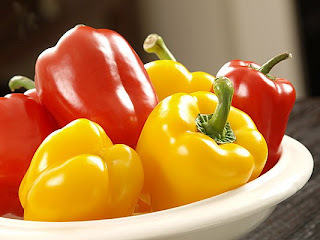 Red, yellow and orange peppers are recommended over green when it comes to nutritional value. We eat lots of bell peppers! They are so versatile and simply delicious in salads.